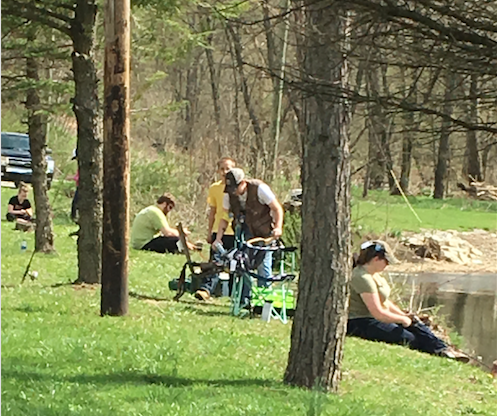 For the second year in a row the Valley Inn Sportsmen’s Association stocked trout in Pigeon Creek for Opening Day. Starting at 7AM on Opening Day, 500 Rainbow Trout were released into Pigeon Creek between Peno Plaza on Park Ave, Monongahela, to the State Route 43 bridge on Bentleyville Rd. Interestingly, it wasn’t just ‘put & take’ fishing. I saw a number of trout caught & released. And it’s not a wasted effort either. One angler reported two trout caught recently, before the stocking, that had survived from last year’s stocking. A rainy summer certainly helped. The stocking also included 20 tagged fish that were worth prizes ranging from merchant gift cards to $100 cash. Great to see such support from the community. Frodo ( the wonder Poodle ) & got there about 11:30AM. Might as well give folks time to catch some fish. And catch them they did. We made our first stop near Peno Plaza. Groups of families & friends like this dotted the bank at every place accessible from some parking area. Weather was in the high 60’s, sunny & mild. Perfect. Over several stops I found a number of anglers who’d caught from 1 to 3 trout. I saw 3-4 caught while we were walking along. One angler I talked with had released a trout & then pulled in this nice looking Monongahela River ” native trout” while we were chatting. 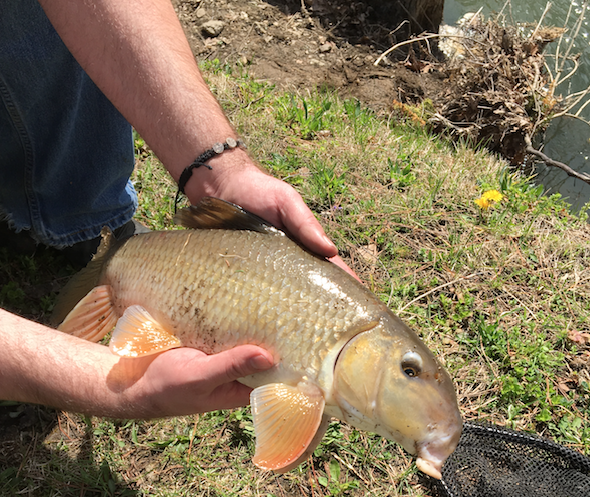 Yes, I know what a Carp is. Another fellow across the way hollered over that he’d caught & released three legal sized Smallmouth Bass. And again, while we were watching he reeled in a fat Sheephead. They were more than happy to pose for a shot. An angler who had caught three trout had also caught a pan sized Rock Bass. 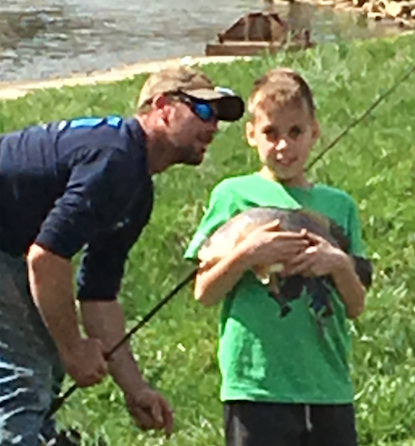 Next to the fact that there were a lot of family groups out there, the second most gratifying thing was that anglers were catching fish out of the spectrum of species found in the river & tributary system. That tells you that there is also a self reproducing sport fishery potential there. Many thanks again to the Valley Inn Sportsmen’s Association, merchants & individuals for supporting this event. Thanks to the volunteers who got up at an early hour on their Saturday to haul buckets of fish to the water. And thanks to the members & organizers who simply hop scotched from fishing spot to fishing spot to insure that things were proceeding safely & orderly. Well done. A few weeks ago a Mute Swan and it’s ‘flock’ – 2 or 3 Canada Geese and a similar number of Mallard Ducks – moved onto about the only open stretch of water on Peters Lake. As the ice receded they stayed along the same shoreline, just spread out a bit. As the ice cover grew they retreated back into a small inlet close to the trail which circles the lake. At one point the open area was scarcely the size of a bathtub. 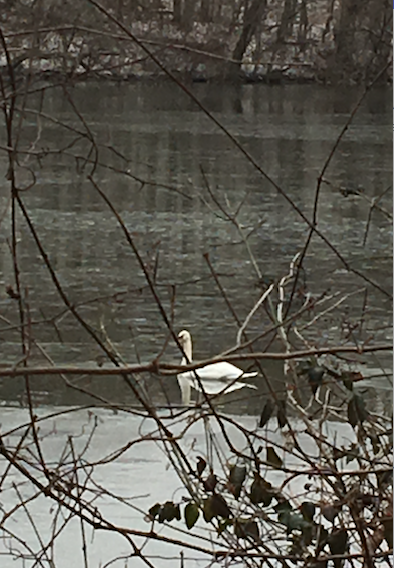 The swan floated in it and some of the other birds stood on the ice nearby. But as the other birds joined the swan in the water the open area slowly grew to a small room size. This morning, Wednesday, I took Frodo for a very short walk along the opposite shore where we had some protection from the trees. 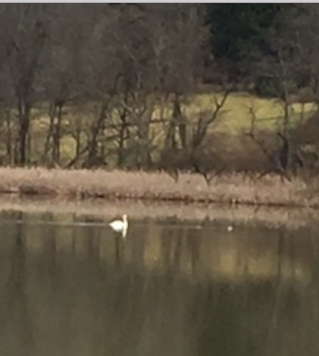 Looked like the swan & some of his buddies were still there so after the walk I drove thru the neighborhood to the opposite shore. There’s no roadway around the lake. I drove around the parking lot to the point nearest the birds and took this shot through the car window. It was 3F outside & I was cold enough from the walk so, OK, I wimped out. I think you can see the ice coming in on the right side and the shore is immediately on the left. So this is a pretty small patch but, without a doubt, the only open area on the lake. I took this second shot & you can see one of it’s companions stretching it’s wings. I think I figured out what’s going on here. Above the shore on the immediate left is an old service road dating back to when this was a water company reservoir. On the opposite side of that road (now part of the walking trail) are 3-4 small springs coming out of the ground. They flow together, and then through a old concrete culvert several feet below the road surface, before flowing into this small inlet. That spring water will be much warmer than the surrounding ice. The birds paddling and feeding is probably mixing it more thoroughly with the surrounding water, raising its temperature and keeping the water open. Their purely physical activity is probably helping also. It’s not exactly a warm spring spa but I’m sure that’s what is keeping the birds there. There’s water to drink and the roots etc. of plants reachable in shallow water. It certainly looks a lot more inviting than a nearby lake where dozens of Canada Geese were huddled together, perched on the ice, in the middle of a frozen lake. We’ll see how they do when the temperature drops below zero tonight. If they can tough that out, and I think they will, they’ll be seeing much warmer temperatures over next 7-10 days. Hang in there guys. Unfortunately, not all ghosts live just in our imaginations. And some come back to haunt us repeatedly. 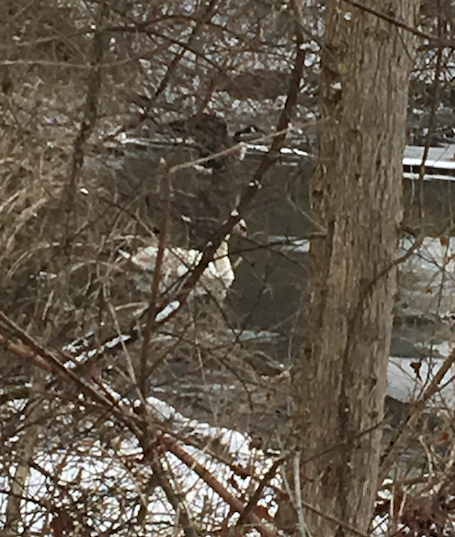 Discovered one of those ghosts along the Montour Trail again. 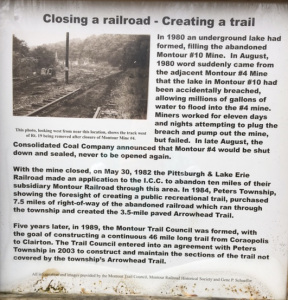 Between mile markers 29.5-29.0, about a half mile from the old Montour 4 mine portal, there’s a covered pavilion along the trail. Courtesy of an Eagle Scout project. It sits next to a ravine which climbs sharply to the back end of a housing plan. Many springs tumble down that hill, under the trail, under a dirt road and then onto Chartiers Creek. Ultimately this drains into the Ohio River. One of the springs seems to be coming out of the rock nearer to the bottom of the hill. It’s stream bed is quite orange. 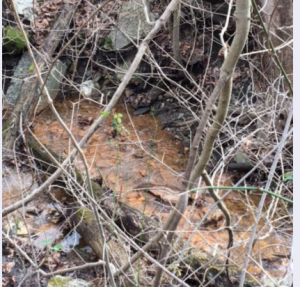 I associate that color with iron contaminated acidic mine drainage. 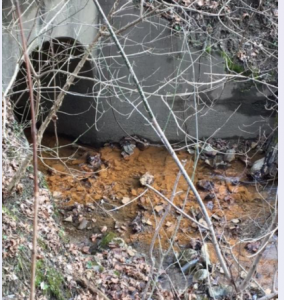 It joins other springs which come from higher up the hill which ‘appear normal’ but from that point on the stream bed is orange all the way to Chartiers Creek. I went back there last week to take some pictures and to test the pH and conductivity of the orange effluent stream. This is a view from the trail of some of the streams on the hillside. The flow on the right has a definite orange color. I started the climb down but, unfortunately, the ‘easier way’ I thought I saw turned out to be a wet drainage way. Tried another route that turned out to be steeper than it looked & covered with wet leaves & moss. Got about 75% of the way down. At that point took a zoom close up of the orange stream bed where it seems to come out of the rock outcropping. And then where it’s culvertized further down under the trail. But below that point the slope ended in a 5-7′ vertical drop to the spring. Way too much adventure for a mid-70 something. Climbed back up without testing the effluent stream. The above information was passed along to the Chartiers Creek Watershed Association and subsequently to the Washington County Conservation District. 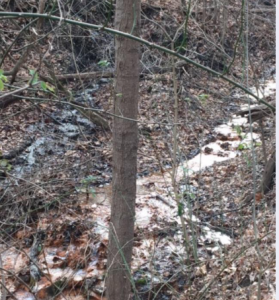 They’re going to try to access the stream at the bottom of the hill where it’s culvertized under the dirt road. Let me know if you’ve got some ‘finds’ to document or explore in your area. The southwestern PA region has a long history of mining & manufacturing activity. Some of this activity ‘died’ a long time ago & evidence of it may be obscured, forgotten, or unknown. I had a discovery experience just like that recently. In the Fall of 2018 we’d moved to a neighborhood in Peters Twp. that was near a section of the Montour Trail that I’d never been on before. So, Frodo, our Standard Poodle, & I have since been exploring that trail. We start out at Mile Marker 30.4 next to the Peters Twp. Sanitary Authority plant on Brush Run Creek. Last week we’d walked only a short way from the parking lot & decided to take an old road/trail that left the Montour Trail & cut sharply up the hillside that lined the trail. It was steep enough & long enough to get the heart started. And it was deserted enough to let Frodo off-leash so that he could run around, explore, & do doggy stuff. A win-win for both of us. When I got tired of climbing, we took a trail across the face of the hillside on to a path & series of cutbacks down. Coming around the last cutback into a clearing saw this locked metal door on the face of the hillside. Moving in closer realized that it was the actual portal into the Montour 4 mine. 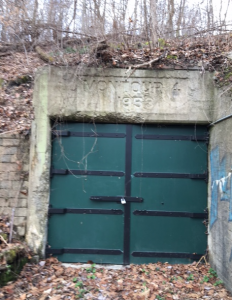 This portal was opened in 1953 and allowed a conveyer belt to bring coal from the mine into a collector which loaded the coal into rail cars parked directly below at the Montour Trail level. Unfortunately, this portal did not have a particularly long use life. 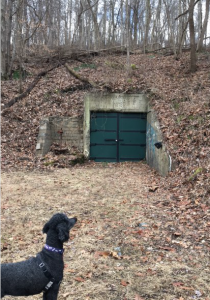 Fortunately, some folks had the vision to see this as the starting place to develop a real regional asset which now connects all the way to Washington D.C.
On Thursday, 11/15, Frodo & I were taking our regular walk near Peters Lake in Peters Twp. It was cold & raining, but a dogs gotta do what a dogs gotta do. It would be a short walk. 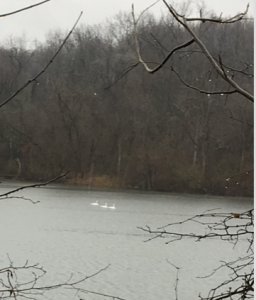 As we walked along the lake, I spotted the three large white birds, pictured below, near the middle of the lake. I’ve seen snow geese in migration that stopped there once, but these seemed too large for geese and there was none of the blue/gray color variations I saw the last time. I wondered if they were swans, but they “didn’t look like swans”. More about that thought later. As soon as Frodo had done his duty, we hustled back to the car. I grabbed my iPhone and left Frodo in the back seat. I didn’t hear any complaints from him as I left. Guess even he’d rather be warm & dry than cold & wet. I took several pictures. These were the best of a bad lot. I’ve since retained a consultant ( my granddaughter) who showed me how to use the cameras zoom feature & then further zoom & take a screen shot of the subsequent pix. 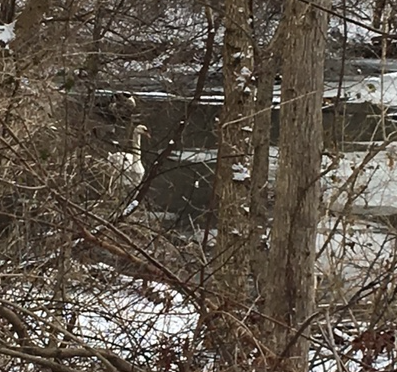 I explained to her that they were most likely swans but could be snow geese (less likely in my opinion) and the birds having a black bill rather than a light colored bill would confirm it as a swan. As she ramped up thru increasingly blurry enlargements she suddenly said, ” they’re getting fuzzy, but they have black bills”. I can almost see them myself but as I read further about swans I concluded there was only one ID likely. 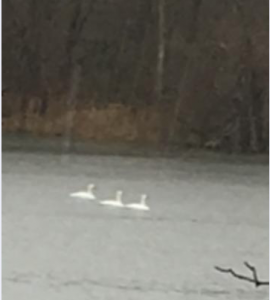 There are 3 swans found in North America. 1. Trumpeter Swan – Although there are some populations around the Great Lakes it’s main range is across the northern tier to the West Coast, then north into Canada. 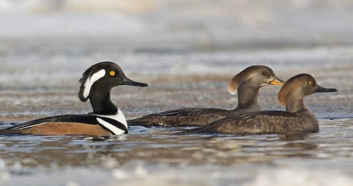 It has a black bill but, more decisively, the Cornell website describes these as ” immense birds ” that can reach 30 lbs + in size with a wingspan of 8 ft & over. It’s described as the worlds largest swan, the largest waterfowl in North America, and one of the world’s largest flying birds. My trio above were clearly not immense bids. 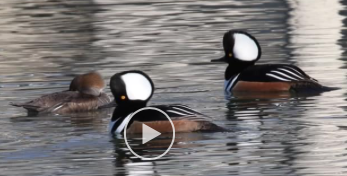 So, not Trumpeter Swans. 2. Mute Swan – This is a non-native, European, bird. 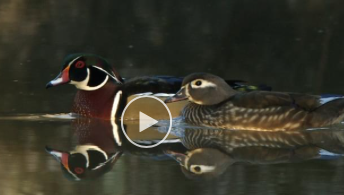 It was imported to decorate our ponds & parks, so it can be found all over the country. It is slightly smaller that the Trumpeter, but clearly mine were not mute swans (below). 3. Tundra Swan – This is a white swan with a black bill. It is considerably smaller than Trumpeters or Mutes. It’s summer breeding range is, as the name suggests, along the Arctic Circle from Canada to Alaska. 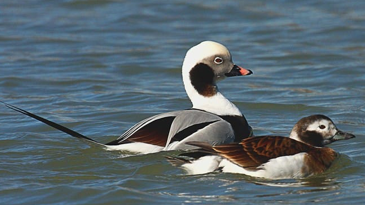 In the Fall, easternmost populations take a migratory route that can pass over W PA on their way to wintering grounds along the Atlantic coast from Maryland to the Carolinas. I think this is the bird I saw. Comfortable with the ID, I wondered why my first impressions were that they ” didn’t look like swans “. And then I came to understand why I expected swans to have a certain look. * The only live swans I had ever seen were likely those stocked in parks & ponds. These were invariably Mute Swan. * Early images of swans, in e.g. Disney movies, were also Mute Swan. * As a child, my reading included the classical fairy tales of European authors like Hans Christian Anderson and the Brothers Grimm. Naturally, if the story had anything to do with a swan, the illustrations would be that of the European Mute Swan. * As a result, my minds classical image of a swan was that of a large white bird with swept back wings held high on the back; a long, gracefully arched neck; right down to the large black ‘nose bump’ at the base of a light colored bill. In short, a Mute Swan. I rather enjoyed that short voyage of discovery. I hope you have the opportunity for similar ones. Have you watched the drone footage of flying over the Mon?